While some areas begin to emerge from the crisis, low-wealth communities and communities of color continue to struggle. Despite these challenges, the last two years brought many victories. Our communities created tools to help address the dangers of vacant properties, including vacant buildings ordinances and land banks. Banks stopped offering payday-like deposit advance loans. Richard Cordray was finally confirmed by the Senate as director of the Consumer Financial Protection Bureau (CFPB), and Mel Watt was confirmed as director of the Federal Housing Finance Authority (FHFA). 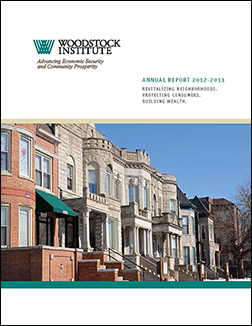 In our 2012-2013 annual report, our stories focus on some of the big issues—vacant and foreclosed properties, retirement savings, and consumer protection—that have been key to Woodstock Institute's mission and recent work. Along with our community and advocacy partners, we will continue to tell these stories as we work to achieve our mission of a just financial system in which lower-wealth persons and communities, and people and communities of color, can achieve economic security and community prosperity. I hope you will take a few minutes to read our annual report. We look forward to working with our partners, board of directors, and policymakers to make the next two years even more impactful.